UPTE-CWA Local 9119 Healthcare, Research, and Technical members went on a one-day solidarity strike on April 10 in response to UC's Unfair Labor Practices against AFSCME 3299 to show UC executives that their illegal intimidation and other underhanded tactics won't be tolerated against any UC workers. Although Wednesday's strike was in response to UC's illegal intimidation tactics against AFSCME 3299 and is unrelated to UPTE-CWA negotiations, UPTE-CWA members continue to fight for a fair contract. The University of California's so-called "Last, Best, and Final Offer" for Research and Technical members contains unnecessary and unacceptable cuts including eliminating step increases for pay, no daily overtime or protections for full-time work, putting pension benefits in jeopardy by pushing new hires to choose a risky 401(k), and more. The offer would also limit the right to file a grievance in cases of sexual harassment and sexual violence. 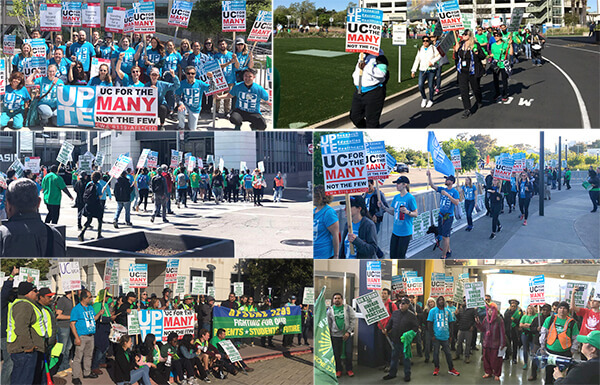 UPTE-CWA Healthcare, Research, and Technical members went on a one-day solidarity strike in response to UC's Unfair Labor Practices against AFSCME 3299 to show UC executives that their illegal intimidation and other underhanded tactics won't be tolerated against any UC workers. CWA members at Cornerstone Staffing Solutions ratified an agreement with RightStone with a 100% yes vote. The agreement contains a 3% retroactive general wage increase across the board, while preserving all the benefits at the current levels and maintaining all other terms and conditions of the agreement.